Mr. Beasley talks with friends during a reception for him and his family for their donation to the Thomas W. Beasley Institute for Free Enterprise at Belmont University in Nashville, Tennessee, June 14, 2018. 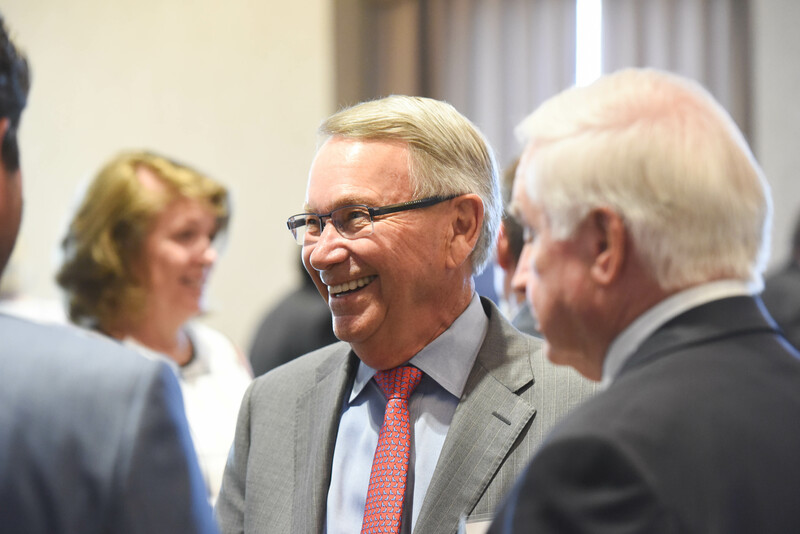 The family of businessman Thomas W. Beasley recently made possible a $2 million endowment in Belmont University’s Jack C. Massey College of Business. The endowment will establish the Thomas W. Beasley Institute for Free Enterprise within the Massey College, and the Institute will promote the study of the free enterprise system by providing support for a director of the Institute and sponsorship of business-minded student organizations. The Thomas W. Beasley Institute for Free Enterprise will support the mission of Belmont University and the Massey College of Business by teaching and training students how the ideals of free enterprise and individual freedom promote a free and prosperous society. The Beasley endowment will also provide funding for a Director position for the new institute, and that to-be-named faculty member will be responsible for delivering programming that offers students and the broader Nashville community the opportunity to learn from scholars, entrepreneurs and thought leaders about the vital relationship between free enterprise and human prosperity. In addition, the funds will support the ongoing work of student organizations within the Massey College, including Belmont Enactus. A global nonprofit, Enactus serves a community of student, academic and business leaders who are committed to using the power of entrepreneurial action to transform life. Belmont Enactus has long been a leader in this arena, recently winning the regional Enactus competition for the 13th consecutive year. Tom Beasley graduated from the United States Military Academy at West Point in 1966 and served as a commissioned officer in the U. S. Army in Vietnam, the Panama Canal Zone and the Republic of Nicaragua. He was awarded the Silver Star and two Bronze Stars for valor in Vietnam. Following his graduation from Vanderbilt Law, he practiced locally for several years before co-founding the Corrections Corporation of America (now CoreCivic) in 1983, where he served as president, CEO and chairman of the board. Beasley later served on the Board of Directors for two companies founded by Belmont alumni, Infrastructure Corporation of America and Horizon Resource Group. As part of his commitment to quality education, he has served on the State Board of Regents, the Cumberland University Board of Trustees and on the boards of Education Corporation of America and Community Education Partners.